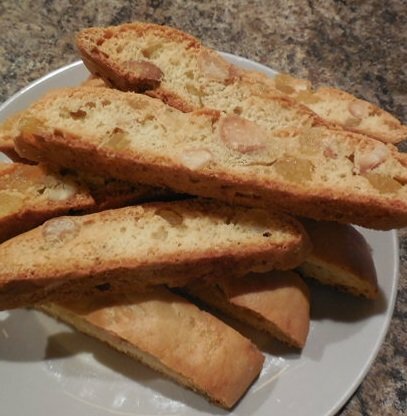 If you are just starting to make Biscotti, gluten free Biscotti is not the easiest place to start, because ingredients to make gluten free baked products, are more complicated, can be difficult to find, and cost more. On the other hand if you are gluten intolerant or you bake for someone who is, this is your only choice. With the knowledge I will help you gain; you will be successful and enjoy some delightful results. Before going too much further let’s make sure that we are on the same page when it comes to what Gluten Free means and why cooks bake this way. 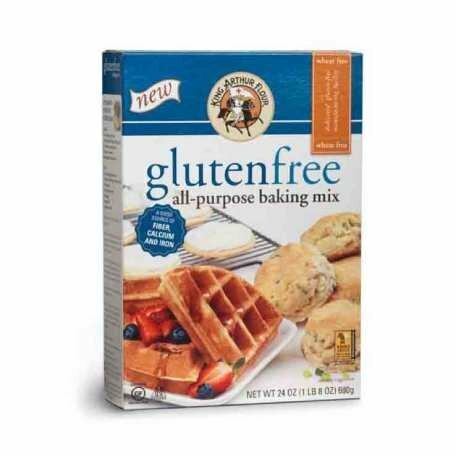 “GF” means gluten-free, so when you see GF on a products label that means that it is gluten free. I will use GF interchangeably with gluten free in my content mostly because I am sometimes lazy. Gluten is a protein complex found in wheat (including kamut and spelt), barley, rye and triticale. A gluten free diet is the only medically accepted treatment for celiac disease. A GF diet might also exclude oats. Medical practitioners are divided on whether oats are acceptable to celiac disease sufferers or whether they become cross-contaminated in milling facilities by other grains or when grown in rotation with wheat where wheat seeds from the previous harvest sprout up the next season in the oat field and are harvested along with the oats. Only you can decide what is right for you or the ones you bake for. Of course if you are looking to bake products that are GF; you are probably gluten intolerant, or you know someone who is, and therefore know more about this than I do. 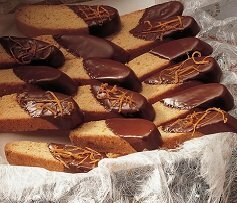 I have family members who suffer from celiac and that is why I bake these GF Biscotti for special occasions. If you are new to Gluten Free Baking and would like to learn more and have more recipes on-hand check out these at Amazon where you can review them and find many more baking books. GF Biscottrecipes can be temperamental. Even an extra tablespoon of water in a baked product can cause the recipe to fail. Use a graduated, clear, liquid measuring cup for all liquids. Place it on a level surface and read it at eye level. Select the correct dry measures (e.g. ½ cup and ¼ cup when the recipe calls for ¾ cup). For accuracy use the “spoon lightly, heap and level once method” of measuring. For small amount use measuring spoons, not kitchen spoons. Dust your work surface and your hands with GF flour before beginning to try to form the dough into logs. It will be a sticky, if the dough is to soft and sticky, refrigerate for 15 minutes and try again. Shape the logs into and even shape and thickness for more even baking. Shiny baking sheet produce and softer-bottomed baked log, the second baking will crisp the biscotti without over baking the bottom. 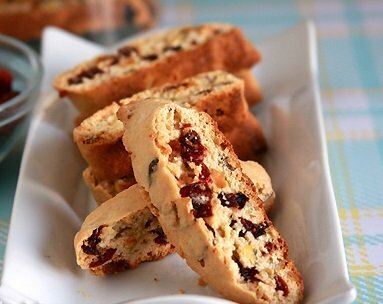 I will show you how, and once you know how, you'll be able to bake better gluten free biscotti than what you usually find in the gluten free section of your favorite store or specialty shops. All it takes is a little time and the right recipe.